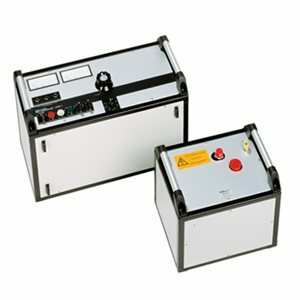 The high voltage test set HPG 70-K from SebaKMT is a fully insulated test set for DC testing up to 70 kV. Thanks to its fully insulated design this system is ideal for stand-alone applications. The DC voltage is obtained through a bridge rectifier which ensures a very low ripple of the test voltage. Moreover the DC voltage is measured on the secondary side and therefore ensures a precise output voltage.